We hear you were trying to DIY a Mr. 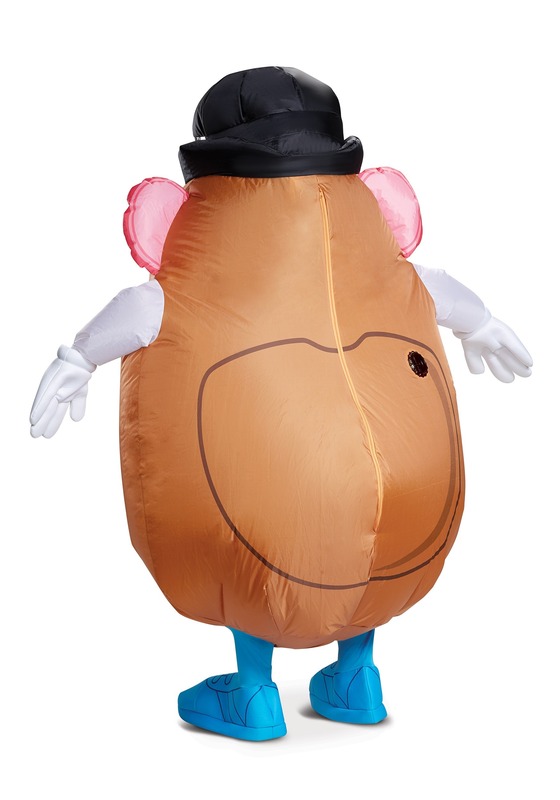 Potato Head costume for Halloween. Tsk, tsk, tsk. You know how we feel about that. Not only do DIY costumes often fail to hold up to true Halloween revelry, but this costume, in particular, was bound to give you problems. C'mon...a round frame is notoriously hard to build, so how did you go about it? Oof! Paper mache? That sounds...messy. And what a large balloon you would have needed! But allow us now to step in and do what we do best—present you with the perfect costume, right before your very eyes! Feast on the beauty of this Inflatable Mr. 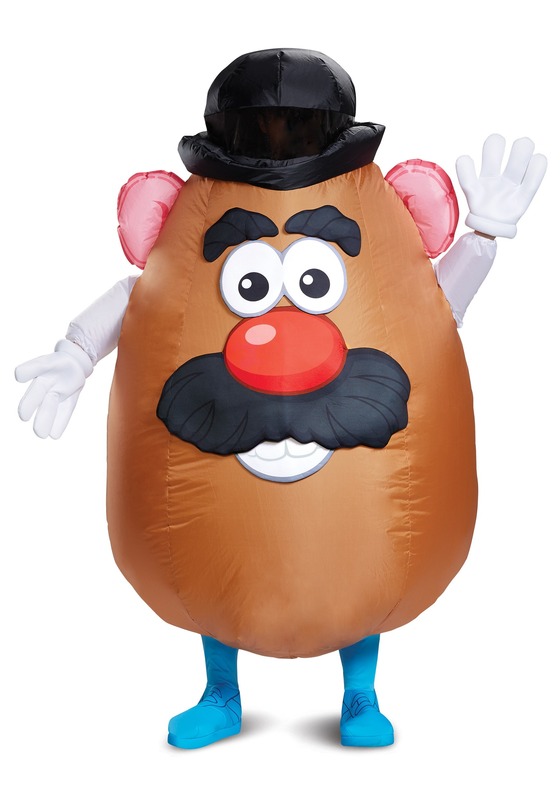 Potato Head Costume for Adults. Yep, that's right, we said inflatable. So you won't have to worry about perfecting that hard-to-achieve potato shape. You can just blow this baby right up and enjoy a night dressed as you favorite classic character. We don't like to brag or anything, but...we're pretty good, right? This look is bound to delight revelers young and old as you grace the costume party in an outfit that blends pure nostalgia with some pretty cool costume technology! This clever costume looks just like everyone's beloved childhood toy, but without all the spare parts to misplace throughout the night's festivities. It features Mr. Tater's signature mustache, red nose, eyes, ears, top hat, and glove-topped hands. All that fun, plus, who doesn't love a costume that offers total anonymity? You'll be unrecognizable as yourself, but instantly beloved by all! Careful, all that fame, recognition, and praise may just end up going to your head. And from the looks of it, you can't afford for it to blow up any bigger! We're glad to have saved you from the great DIY disaster of the season; never forget: we've got your back! This was a HIT on Halloween! 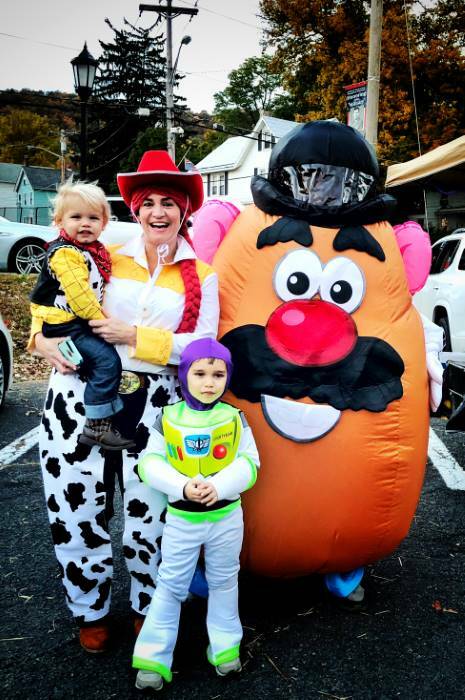 Kids and entire families wanted to take a picture next to Mr Potato Head! Not easy to walk in, so it’s better. For a trunk or treat where you stand at your car and NOT walk. Very comfortable and fit my XXL husband. Got Mr. Potato Head in a timely fashion. I haven't worn it yet but I tried the fan and it works. I'm shorter than the min. ht req. for the costume but I trust it will work out. One thing to note. the wearer will be looking thru the bottom of the brim of the hat. Also the facial features are included separately and need to be velcro-ed on. The look okay. I'll add more notes if I have any problems. THIS WAS BY FAR ONE OF MY TOP 5 COSTUMES I HAVE EVER HAD! More importantly THE BEST INVESTMENT for a COSTUME I ever made. FITS PERFECTLY, I'm a large dude too. (6 ft/ 290) Excellent price, great job on shipping to get it on time. I AM NOW MAKING THIS MY HALLOWEEN GO TO SHOP! Here is a link to view the costume in action at the company I work for. ENJOY!